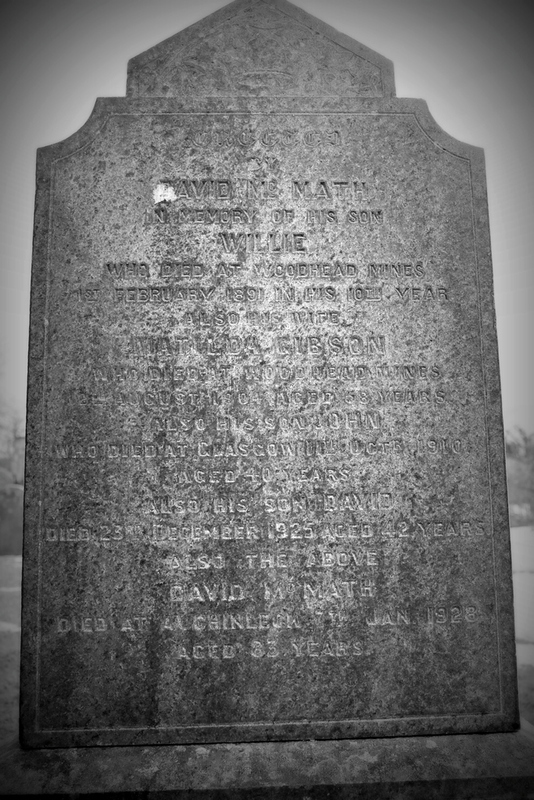 Erected by David MCMATH in memory of his son Willie who died at Woodhead Mines 1st February 1891 in his 10th year. Also his wife Matilda GIBSON who died at Woodhead Mines 12th August 1904 aged 58 years. Also his son John who died at Glasgow 11th Oct. 1910, aged 40 years. Also his son David died 23rd December 1925 aged 42 years. Also the above David MCMATH died at Auchinleck 7th Jan. 1928 aged 83 years. GC, “Kirkyard gravestone 219,” Carsphairn Archive, accessed April 20, 2019, http://carsphairn.org/CarsphairnArchive/items/show/230.